Your visit to Hungary’s capital would not be complete without tasting the nation’s great wines. Although Budapest does not have vineyards, you can taste and buy wines from all the country’s wine regions in the city’s many tasting places and specialty wine shops. Budapest offers many places to taste local wines from historic cellars to cozy bars, and wine restaurants. Here are some of our favourite spots to sample Hungarian wines. 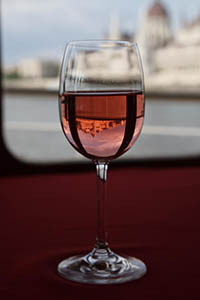 Combine sightseeing on a Danube boat tour with sampling 7 fine local wines. tasting 7 wines (8 cl each) from various wine regions of Hungary including the Tokaj area famous for its aszú and other dessert (and dry) wines. An ideal program to start a memorable afternoon or evening in Budapest. Price: full price: 33 EUR, students: 31 EUR. with meal to Etyek village, west of the capital city in the Etyek-Buda wine region of Hungary. A direct transfer takes you to the village from the centre of Budapest and back. You’ll explore the local wine cellars, talk to the wine makers about wine making in Etyek, taste wines, and end the trip with a traditional dinner Hungarian style. Find out more about the Wine tour to Etyek village. 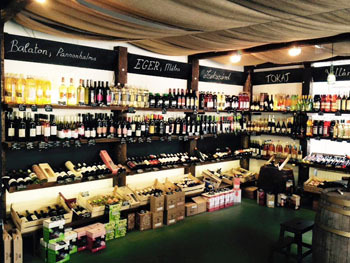 Sample the best Hungarian wines in a stylish, centrally-located wine gallery and shop. 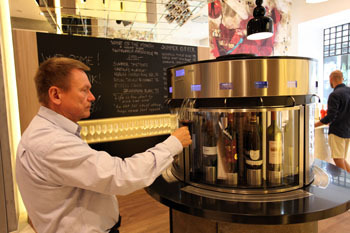 Around 60 of the finest bottles from the country’s 22 wine regions can be tasted form cutting-edge wine tasting machines. You can have just a sip or half a glass! You decide what and how much to taste! Sit-down tasting programs with snacks (ham and cheese plate, pogácsa, water) are also available. Some exquisite bottles can only be tasted here. At other places – even at the vineyard that produced the wine – a rare bottle will not be opened for tasting. 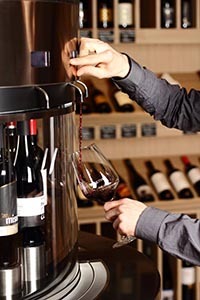 CultiVini’s modern wine preserving machines keep wine in perfect shape for a couple of weeks. You can peruse the elegantly displayed bottles, choose one and have a sip from it before buying. Worldwide delivery is available, you don’t have to fret about how to pack it in or carry the bottle with you. 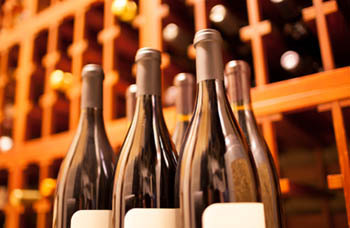 Expert sommeliers and a custom mobile application provide information on the wines, wine regions and tasting notes. 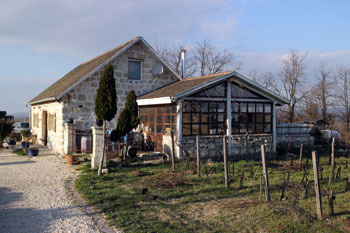 See details and reservation in CultiVini Wine Shop near Váci Street. TIP: Find out more about Hungarian wines and wine regions! lovely cafes, and some great restaurants (21 Magyar Hungarian Restaurant). 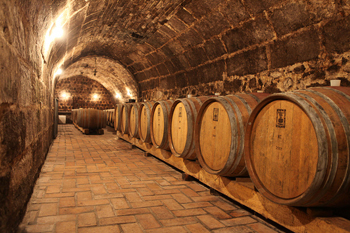 The cellar is part of the historic cave labyrinth under the ground in the castle district. 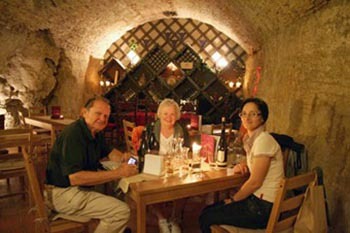 Sipping wines in the cool stone cellar is a perfect way to end a long day of sightseeing in the area. You can choose from several wine tasting menus that include some of the best wines of the country: Tokaj, Szekszárd, Eger. 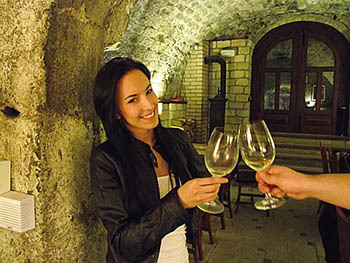 Learn more about wine tasting in Buda Castle. The city has more than 30 bars, bistros, cafes that carry a wide selection of wines, both local and international. Bortársaság is one of the biggest wine distributors in Hungary. They have several shops within the city with the main outlet in Batthyány utca. Address: Lánchíd utca 5., Buda, district I. Address: Ráday utca 7., Pest, district IX. Opening hours: Mon – Fri: 12.00 – 20.00, Sat: 10.00 – 15.00 Bortársaság also has outlets in some shopping centres in Budapest: the Árkád, Rózsakert, MOM Park, Hegyvidék, and Budagyöngye malls. TIP: You can taste nearly 50 wines by the Bortársaság in the Klassz Bistro (Andrássy út 41., district VI. ), one of the best restaurants in Budapest. 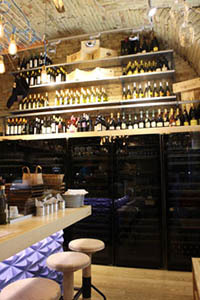 You can also by wines in the bistro’s shop. Borháló operates a network of shops mainly out of the city centre. The most centrally located ones are on Grand Boulevard/Nagykörút and in Páva utca in district IX. Kind, expert service, affordable prices. 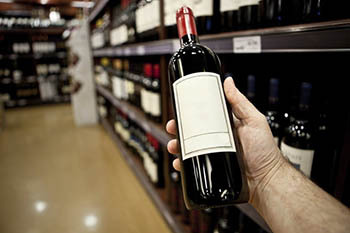 A large shop with a wide selection of wines from the country’s 22 wine regions. 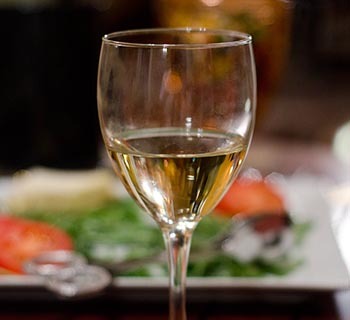 They regularly host tastings, wine dinners and other wine events. Address: Páva utca 2., district IX. 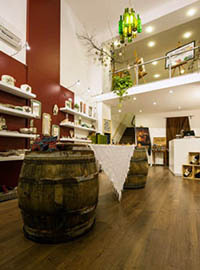 Address: Arany János utca ., district V.
Wines n’ Roses is a fairly new shop opposite the Pommo D’oro Italian restaurant that specializes in fairtrade flowers and wines from the Mór region Hungary’s smallest wine producing area located cc. 90 km west of the capital. Tasting is not available here but you can buy quite nice wines by Csabi Miklós wine maker at fair price. Prices: 2 200-3 000 HUF/bottle. 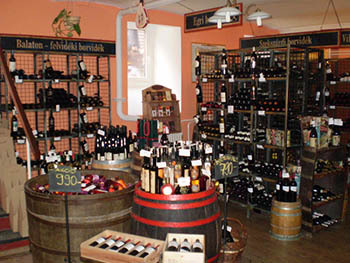 a wine museum with more than ten thousand bottles of Hungarian vintage wines. In the shop you can select from around 200 types of excellent quality wines. Advanced booking is required. Address: Bajcsy-Zsilinszky út 56., district V.
A great variety of wines from Hungary and Italy tasting for either smaller or larger groups is available. Address: Bartók Béla út 8., district XI. This charming shop on up-and-coming Bartók Béla Boulevard in Buda near Gellért Hill sells local wines and ceramics. As the owners state on their website the four elements – earth, fire (sun), air and water – can be found in both wine and pottery (clay) that’s why the two complement each other perfectly. strolling through the more than 100-year old and several hundreds kilometer long cellar complex. A couple of 2-3 day festivals welcome wine lovers from all over the world every year. children programs ensure that everybody finds something interesting to do. The Budapest International Wine Festival is usually on the 2nd weekend of each September: Sept. 06 – 09. in 2018. Both Hungarian and international wine makers introduce their best wines. 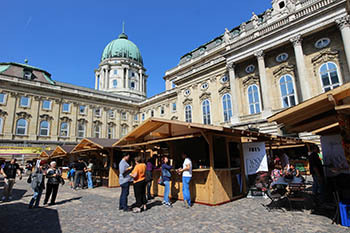 This festival is rather crowded due to its premise which is one of the most popular tourist areas in the Hungarian capital without the wine festival. Admission: approx. 2 800 HUF/adult: a wine tasting glass with a small bag to carry the glass in it, and usually a couple of tasting coupons are included. Junibor Wine Festival by the Basilica – you can meet and taste the wines of the young generation of local wine makers. Gastronomy and other wine-related programs accompany the 4-day event (August or end of September). TIP: Explore Budapest Wine Bars on a tour in July 2018 between 16.00 – 22.00. Nearly 30 bars and cafes participate in the event in both Buda and Pest. Perhaps the best way to find out which wines appeal to your taste is to taste some in a good wine restaurant, and then buy the ones you like in a wine shop. This way you avoid buying pig in a poke. Bock Bistro is one of the best restaurants in Budapest that is among the couple of nominees expected to get a Michelin star. Owned by one of Hungary’s most famous and talented wine maker, József Bock from Villány Wine Region, the Bistro has the best wines to offer. The food is of exceptional quality too. Staff is kind and attentive. Table reservation is highly recommended because this lively restaurant in the city center tends to be busy. Bock Bistro is a first class place and it is reflected in the prices, but it also provides good value for the money (two can dine for about 60-80 EUR incl. starters + main dishes + a bottle of wine). central location (5 min. from Váci Street) and homey atmosphere make Borbíróság an excellent choice if you want to have a taste of local wines and food. Address: Belgrád rakpart 13., district V., Tram 2. Some great Italian wines and food. While sipping a glass of wine on the terrace you can admire the fine view of the Gellért Hill on the Buda side of the Danube. 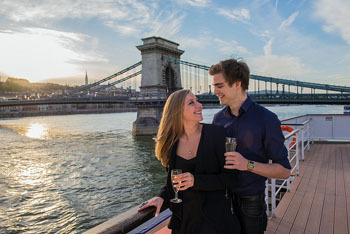 TIP: Try also our Craft Beer Cruise program while in Budapest! Hungary’s evolving artisan beer scene offers some exciting brews to taste. You’ll sample 5 x 150 ml local craft brews + get 1 pint for FREE. A 2-hour river excursion, snacks, live music by a Gypsy orchestra for 27 EUR! If you come to Budapest for more than just a couple of days do visit the nearby wine regions to get a first hand impression about the country’s wines and viticulture. The best way to get to these places is by car, if you came by air you need to rent a car. Although there’s a fairly good train service in Hungary, for first time visitors and foreigners it is a bit difficult to know your way around train timetables. Moreover, driving is more flexible than train travel, you can stop when and where you wish to. Lying about 40 km far from Budapest this wine region is the nearest to the capital city. The climate and the soil provide good conditions for producing quality whites. This region produces the base wines for champagne making too. Location: 130 kilometers north-east of Budapest, at the foot of Bükk Hills. It’s worth visiting Eger not only for the famous Egri bikavér (Bull’s Blood) red wine, but for the town’s rich history and sights. Eger is one of my favourite towns. The Szépasszony-völgy (literally Beautiful Lady’s Valley) has many old wine cellars carved into the hill. You can taste and buy wines from the local producers. The more than 200-years old National Wine Museum and the István Cellar of the Hotel Korona besides wines from the Eger region introduces you to other Hungarian wines and history of wine making. Address: Eger, Verő-szala utca 66. Address: Eger, Szépasszony-völgy Tulipánkert út 40. Address: Eger, Nagykőporos út 11. Our love of Budapest reflected on these pages since June/2005. Hopefully you keep returning and find more and more things to adore in our city!